Supposing some callous and whimsical aliens were to kidnap 120 humans and force them to play successive rounds of ‘Russian Roulette’, with the threat that if they did not play, both they and five of their close friends or family would die. You might think that six rounds would eliminate all of these unfortunates. But if the six-shooter revolver were re-spun each time and there was an exact 1 in 6 chance of death each time, I estimate 33 or 34 alive after six rounds. Each round eliminates one sixth of the players, but only the surviving players. Chances of survival after three rounds is 5/6th of 5/6th of 5/6th, which I make just under 70%. After 24 rounds there would probably still be one or two left, probably gibbering wrecks but still alive. If such a ‘Conference of Russian Roulette Players’ actually happened, one can safely assume that the one or two survivors would be absolutely certain that there had some special quality, or had been preserved for some purpose. They would think that from a pattern that can be seen as blind chance, looking at it as an outsider. Now consider this in relation to ‘entrepreneurs’, risk takers. Lots of people follow business plans that go against conventional wisdom. A lot of them fail and get sneered at as fools. A few succeed and are praised, with the big successes hailed as geniuses. But is it any more that another ‘Conference of Russian Roulette Players’? The above are my thoughts after reading a book called Outliers: The Story of Success by Malcolm Gladwell. He starts by giving a definition of outlier, something that is situated away from or classed differently from a main or related body. Starting with a small town that is unusually happy and healthy thanks to a solid social structure, he then goes on to look at sporting successes. Professional hockey players in Canada turned out to be mostly born in January, February or March, which makes sense since that is the cut-off date for age-classes is January 1st. Those born in the first three months of the year are the oldest in their age group, and so do better, try more and get more training. Next he looks at Bill Gates. The man was smart, certainly, but also lucky to have access to a time-sharing terminal in 1968, when it would have seemed as exotic as a moon-rocket. He was also just the right age: Outliers lists a lot of the computer-industry success and notes that most of them were born in 1954 or 1955. The book earlier notes that most of the business titans of the USA’s ‘Gilded Age’ after their Civil War were born in the 1830s. My comment would be that he doesn’t pay enough attention to the partnerships. He does of course list Lennon and McCartney for the Beatles: probably the other two were replaceable and in fact Ringo Starr was a late joiner who was drummer with another band when the original Beatles were playing in Hamburg. But in the computer world of the 1970s, a lot of the successes were partnerships between two individuals, often with gifts in different areas. Bill Gates and Paul Allen for Microsoft, Steve Jobs and Steve Wozniak for Apple, Mark Zuckerberg and Eduardo Saverin for the beginnings of Facebook, replaced later by Sean Parker. Parker had successes before Facebook, beginning with Napster in partnership with Shawn Fanning. You also learn about a researcher in the USA who looked for children with super-high IQs, followed their later careers, and was disappointed to find that most were ordinary, some failures and no real high-achievers. It turned out the study also checked but rejected two future Nobel laureates, William Shockley (transistors) and Luis Alvarez (elementary particle physics and dinosaur extinctions), neither of whom had the abnormally high IQs that were being sought. Another strange and tragic fact – of the selected high IQ group, “almost none of the genius children from the lowest social and economic class ended up making a name for themselves.” The USA is nothing like as socially mobile as it pretends, or as its downtrodden poor like to suppose. And a lot of the successes from poor backgrounds are in business, sport or entertainment, none of which need the steady dedication to apparently pointless activities that you need for higher education and professional qualifications. Also business, sport and entertainment success don’t have that much correlation with high IQ: other factors count for more, including a gift for handling people. Lawyers need to be good at handling people. But the book notes that the biggest help is to be in field that suddenly expands. Bill Gates in Personal Computers. Several law firms that were once ‘second tier’ but had the expertise when hostile takeovers became much more normal in the late 1970s and early 1980s. The book doesn’t mention that this shift made a lot of individual fortunes but didn’t really improve the US economy, which grew at least as well in the more genteel 1950s and 1960s. The supposed miracles have been mostly delusion. What the book broadly suggests to me is that material success is part talent, part effort but a very large measure of luck. Also most of it seems to happen without the lure of high pay, which only a few people get. One extra idea – it would be very interesting if someone – maybe one of the new computer billionaires – were to fund a major study of giftedness. Get a large sample, mostly people with some sign of talent but no outstanding achievements. Find out how (if at all) they differ from the high achievers. Maybe persuade the Nobel Committee to add their name to it – their reputation for secretiveness would be a help if one were after highly personal details (including sexuality) that people might be hesitant to talk about. I used Excel to start with 120 and keep multiplying it by 5/6th. This ignores the fact you can’t have fractions of people alive or dead, but can’t be far from the correct figures. If you doubt the maths, think of an inverse of this problem. Instead of shooting themselves, the participants open one of six boxes, one containing a gold coin and the others empty. After 24 rounds, the average would be 3 coins each. But the actuality would be some people with more than three and probably one or two unfortunates with nothing. Unfortunates in the gold coin game, lucky survivors in Russian Roulette, the maths is the same. The photo of the original Microsoft comes from the Wiki, available under ‘fair use’ rules. 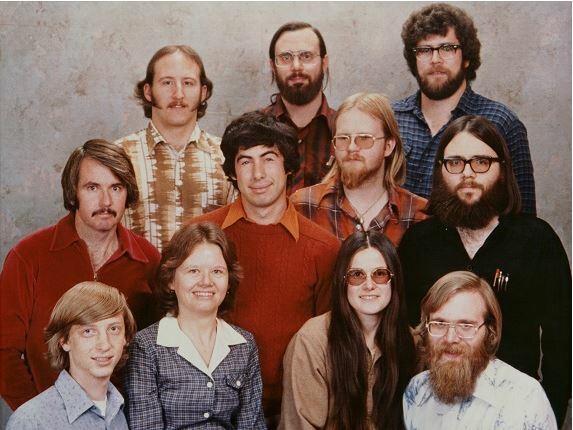 Gates is on the left in the front row, looking rather different from his current appearance. On the right is Paul Allen, co-founder and probably an essential contributor to the company’s success. First published in Problems of Socialism and Capitalism, 2012. Two other articles of mine illustrate the element of luck: one about Sir James Goldsmith and the other about Richard Arkwright (who was also dishonest).